If you’ve been following this food blog for a while, you may have noticed that there’s an inordinate amount of pasta dishes that appears throughout this blog. That’s because it’s a relatively inexpensive and effortless way of quickly throwing together a satisfying and filling meal. What’s all the more remarkable is that I rarely resort to the standard routine of dried pasta, jarred sauce and grated cheese. No, instead, what you’ll find is an astonishing and varied range, from the mundane to the luxurious to the sublime. After today’s post, you can add two more ideas to the recipe index. Both dishes feature tajarin noodles, a thinner variant of tagliatelle pasta that originally hails from the Piemonte region of Italy. Both dishes evoke the current season, although one is more firmly rooted in the Italian tradition than the other. If you elect to make this dish and tajarin pasta is unavailable, consider choosing either spaghetti or thin spaghetti instead. Remember that tajarin is a fresh pasta and that most spaghetti is dried, therefore cooking times for the pasta will be different. Note that this recipe and the one below it are sized to serve one person. 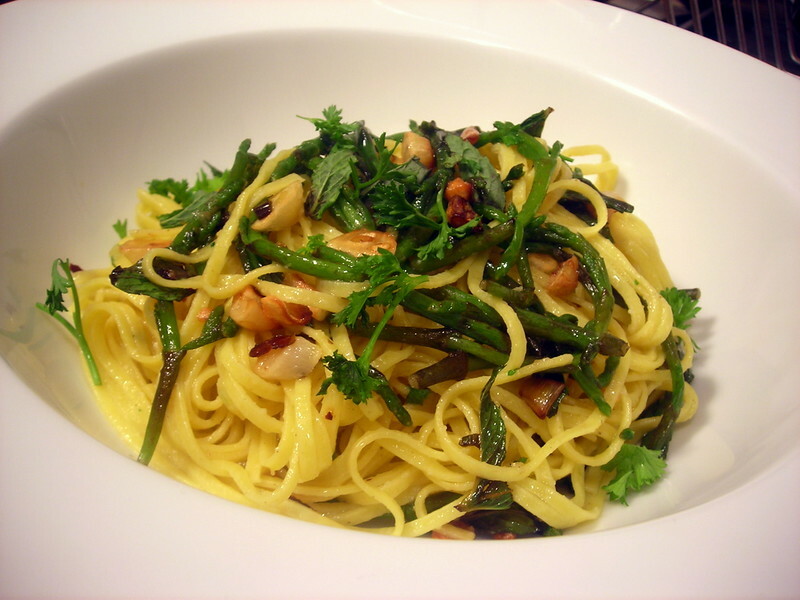 Tajarin is traditionally an egg dough-based pasta. Feel free to substitute a pasta made without eggs or wheat flour, in order to make it vegan and/or gluten-free. Bring one cup of water in a saucepan to a boil. Add the samphire and cook for 2-3 minutes, then remove from heat. Drain and immediately plunge the samphire into the bowl of ice water. Drain and set aside. Bring 2 cups of water in a saucepan to a boil. Add the tajarin pasta and cook for 2-3 minutes or until the tajarin reaches your desired consistency. Try not to overcook. Drain and set aside, making sure to reserve 1/2 cup pasta cooking water. Add garlic and 3 tablespoons olive oil to a large skillet. Gently warm olive oil over medium heat. Once the garlic begins to turn a pale gold, after about 1 minute, add the samphire to the pan. Cook, stirring occasionally, until the samphire turns a bright emerald green, about 2 minutes. The samphire should be, by this time, tender to the bite. Add the pasta directly to the pan. If the mixture seems too dry, add reserved pasta cooking water to the pan tablespoon by tablespoon or until a light sauce is formed. (The consistency is up to you.) Toss a couple of times, to ensure that the tajarin, samphire and garlic are mixed well. Taste for salt and pepper, then remove from heat. Stir in herbs, drizzle remaining olive oil over the pasta, then serve at once. Bring one cup of water in a saucepan to a boil. Add the asparagus and cook for 2-3 minutes, then remove from heat. Drain and immediately plunge the asparagus into the bowl of ice water. Drain and set aside. Meanwhile, melt 1 tablespoon unsalted butter in a large skillet over medium heat. Add the lobster meat, reserved lobster juices and green garlic to the pan and cook, stirring occasionally, until lobster meat is warmed thoroughly. Stir in the lobster roe. Cut the remaining tablespoon of butter into bits, then whisk into the lobster mixture. A light sauce should soon form; you want to cook this until it thickens slightly and the roe turns the sauce a pale orange-pink. If the pan seems too dry, add reserved pasta cooking water tablespoon by tablespoon until the desired consistency is reached. Taste for salt and pepper. Add the tajarin pasta and asparagus to the pan. Toss a couple of times to ensure that the strands of pasta are well-coated with the lobster sauce. Taste for salt and pepper once more, although you shouldn’t need much. Stir in chives, then remove from heat. Spoon onto a pasta serving bowl or plate, then serve at once. Time: About 30 minutes, not counting any prep that may be required, such as removing the meat from the claws and lobster carcass. Both of the pasta dishes in this post are my contribution for Presto Pasta Nights #261, a weekly foodblog event currently hosted by Simona at Briciole and organized by Ruth of Once Upon A Feast. 26 Apr	This entry was published on April 26, 2012 at 6:28 pm. 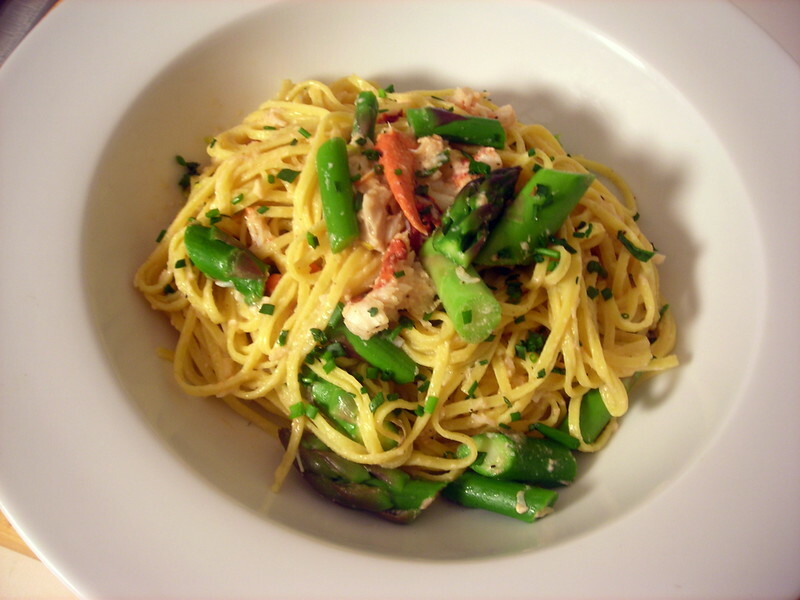 It’s filed under cooking, food, food photography, Italian food, Presto Pasta Nights, recipe, spring, vegetarian and tagged asparagus, dinner, food photography, garlic, lobster, pasta, Presto Pasta Nights, samphire, vegetarian. Bookmark the permalink. Follow any comments here with the RSS feed for this post. Both pasta looks delicious! It’s my first hearing about Tajarin pasta. Does it come as fresh or dry pasta? Where can you buy it? Thanks for sharing! The tajarin pasta shown in these two pictures were bought from Eataly, here in New York City. You may be able to order it from them and have it shipped to you, or perhaps make it yourself. If there is a specialty food shop in your area that specializes in pasta, ask them if it is available. Spaghetti or linguine are good substitutes. Wow! Both dishes look sumptuous. I am particularly intrigued by the first one. In reading your note, I realized I had seen samphire before in a post, but never tried to find it to purchase it. Do you get it at the farmers’ market? It reminds me of wild asparagus. And then I like the pairing of lobster and asparagus. Thank you so much for a very nice contribution to Presto Pasta Nights. Simona, the samphire was bought at Eataly where it sells for $15 a pound (currently). In certain parts of the United States, like the coastal areas that line the Gulf of Mexico, for example, you can forage it for free. I’m not sure about its availability in Italy. The difference between wild asparagus and samphire is that the latter is a sea vegetable and is usually found growing on or near a sandy beach. Hope that’s helpful. Both dishes have me drooling and given that I live in Halifax NS – right on the Atlantic Ocean with lots of sandy beaches nearby, I’m hoping to find samphire – the lobster is easy 😉 Thanks so much for sharing with Presto Pasta Nights.